The United States Congress designated the Hummingbird Springs Wilderness (map) in 1990 and it now has a total of 31,200 acres. All of this wilderness is located in Arizona and is managed by the Bureau of Land Management. Northeast of Hummingbird Springs, which sits near the middle of this wilderness, Sugarloaf Mountain climbs steeply from the Tonopah Desert (1,550 feet) to 3,418 feet and lends this area remarkable scenic value. Over eight miles of the Big Horn Mountains are included in this wilderness. Here you'll find hills and washes and bajadas abounding with saguaro, ocotillo, cholla, paloverde, and mesquite, habitat for desert bighorn sheep, mule deer, and desert tortoise. Kit foxes and Gila monsters race along the ground while Cooper's hawks, prairie falcons, and golden eagles rule the skies. Hummingbird Springs Wilderness receives approximately 6 inches of rainfall each year and average annual temperatures range from 35 degrees Fahrenheit in winter to 105 degrees in summer. Without maintained trails, the area can be backpacked easily, and primitive campsites abound. The water from Hummingbird Springs runs into a catchment accessible via a non-wilderness jeep trail slicing into the area from the southern boundary. This non-wilderness jeep trail is all that separates Hummingbird Springs Wilderness from Big Horn Mountains Wilderness to the south. 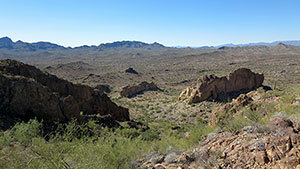 Planning to Visit the Hummingbird Springs Wilderness? How to follow the seven standard Leave No Trace principles differs in different parts of the country (desert vs. Rocky Mountains). Click on any of the principles listed below to learn more about how they apply in the Hummingbird Springs Wilderness.